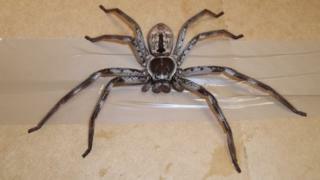 An Australian spider the size of a guinea pig left removal men running scared when it turned up in Surrey. The 18cm huntsman was found in a shipping container of family belongings in Merstham, near Redhill, on Thursday. It survived 10,000 miles of travel over three months and RSPCA officer Annie Janes said it was "lucky to be alive". Dave Aldridge, a manager at Britannia Movers International, caught the "handsome critter" after one of his colleagues ran out of the container. The 55-year-old said: "I had three guys unloading, one ran about two miles up the road when he first saw it. "He's a handsome, furry guy. I caught him in a lunch box and took him home for my six-year-old son to see while waiting for the RSPCA to pick him up." The non-venomous spider was found at the back of the container, stowed away in garden swing parts. "He was about the size of my two hands put together, so quite something to look at," Ms Janes said. "From the empty locust shells found in the container it seems he has thankfully been able to find food during that length of time, but it's a long time to go without water, and he's lucky he didn't get squished by any boxes or furniture." It was taken to the Heathrow Animal Reception in Hounslow, which will arrange for it to be rehomed to a specialist. Mr Aldridge added: "We've had a few creatures in our containers over the years, including a lizard, but he's definitely the biggest spider." The giant huntsman variety can grow to up to 30cm in leg span and Mr Alrdridge said: "I don't think I'd be so brave if he was that big".